Ceylon Petroleum Corporation (CPC) workers called off their strike last night after the Government gave an undertaking not to enter into any legally binding agreements with India without consulting the trade unions. However, the Memorandum of Understanding (MoU) giving an undertaking to jointly develop the Trincomalee Oil Tank Farm, which the Prime Ministers of the two countries were to enter into, will be signed as planned, Petroleum Resources Development Minister Chandima Weerakkody confirmed. The MoU is to be signed during the Premier’s visit to India. “The MoU is only a political undertaking. Further to the MoU, which the Prime Minister will be entering into with the Prime Minister of India, we will have negotiations with the trade unions and other stakeholders as to how to take it forward,” Minister Weerakkody told Daily FT.
Prime Minister Wickremesinghe, along with Ministers Malik Samarawickrama and Anura Priyadarshana Yapa, will leave for India today on an official visit. According to Weerakkody, the Cabinet paper he presented on the matter a few weeks ago proposing to allocate 15 tanks to the CPC, while giving the Lanka Indian Oil Company (LIOC) 10 tanks, with the remaining 74 tanks to be managed by a joint venture formed with India, still holds water despite initial opposition from the union. India has been negotiating with Sri Lanka over the Trincomalee storage facility since 2003, when the Sri Lankan Government, CPC and LIOC entered into an agreement relating to the takeover and related matters of the storage facility. According to the agreement the CPC agreed to lease the storage facilities and the land to LIOC for a period of 35 years, conditional to the lease agreement being signed and executed within six months from the date of the agreement. To date, such an agreement was not signed by the parties although the facility has been used by LIOC since February 2003. According to the Minister, although “issues may exist about the agreement, successive governments have accepted $ 100,000 as a lease payment for using the storage facility.” Several attempts in the past to sign a lease agreement failed due to the inability of the parties to come to an agreement on the terms of reference. Apologising for the inconvenienced caused to the public, Petroleum Trade Union Alliance convener D.J. Rajakaruna claimed that they would take stronger trade union action if the Government dishonours the undertaking given. The strike resulted in a halt in fuel distribution in the country, sending motorists into a fuelling frenzy, with all fuel stations within Colombo running dry. To meet the hike in demand, the Indian Oil Company (IOC), which caters to 15% of the market in the country, has doubled the supply from its Trincomalee-based storage facility. “We doubled quota from our Trincomalee storage distribution. We are sending the additional stocks mainly to Colombo,” IOC Managing Director Shyam Bhora told Daily FT. The Minister assured that fuel distribution would return to normal by noon today, adding that all stations would be supplied with fuel by the end of the day. The Government also agreed to evaluate two other demands made by the trade unions regarding the Hambantota Port and refinery. A discussion with the Cabinet Subcommittee on the Hambantota Port will be granted to the trade unions to raise concerns regarding the proposed agreement with China. The trade unions have opposed handing over operational control of the Hambantota petroleum storage facility to foreign investors. Further, the Minister has also promised to submit the proposal to refurbish the Sapugaskanda refinery to the Cabinet Committee on Economic Management in the near future. Lanka IOC already operates 15 of the oil tanks, the rest have not been used for decades. A Reuters report said IOC has agreed to build a second refinery with a capacity of at least 100,000 barrels per day (bpd) in Sri Lanka, while Indian Prime Minister Narendra Modi in 2015 pledged to establish a petroleum hub in Trincomalee. 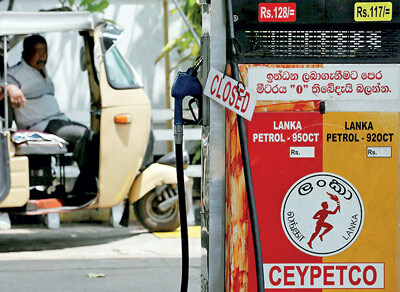 The unions at the State-run Ceylon Petroleum Corporation (CPC) said handing the tanks to Lanka IOC would give it too much influence over fuel stations. «If they are given, they will have the control to decide the market prices,» union leader Rajakaruna told Reuters. A top CPC official said fuel stations could run out of supplies later on Tuesday if the strike continued, though Sri Lanka’s 50,000 barrel-per-day capacity refinery is still in operation. «We have enough stocks, but we can›t supply as workers in the distribution unit have gone on strike,» the official said on condition of anonymity. 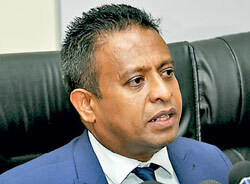 State Enterprise Minister Kabir Hashim said the unions were given false information, as India and Sri Lanka had agreed to hand over 10 tanks to the CPC while 74 were expected to be developed under a joint venture between the CPC and Lanka IOC. «It will be signed between the governments of India and Sri Lanka,» he told reporters in Colombo. A Lanka IOC official told Reuters that due to trade union pressure, the CPC would be allowed to use 10 of the 84 tanks earmarked for the joint venture between the two companies. The Janatha Vimukthi Peramuna (JVP) yesterday justified the strike conducted by all the trade unions of the Sri Lanka Petroleum Corporation demanding solutions for the issues concerning the sale of the Trincomalee oil tank to Indian IOC. Defending them, the JVP said the trade unions’ demands over the Trincomalee oil tank were fair since it is one of the country’s profitable oil stations. According to the JVP, the trade unions are demanding the Government revise the proposed Memorandum of Understanding to hand over the Trincomalee oil plant to India and they demand the right of stocking oil to Sri Lanka Petroleum to make the maximum profit from that. In a statement the JVP further said that it would always take the trade unions’ side because it could not accept the Government’s plan to sell the Trincomalee plant to Indian IOC while the Sri Lankan Petroleum Corporation is in a position to maintain the Trincomalee oil tank. Outlining the dangers of selling the Trinco oil tank to India, the JVP further said that if the Government handed over the operations of the oil plant to India it would put the security of the country at risk.